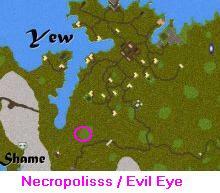 The Evil Eye is unlike any other place I’ve been. The Role Play here is a little to the edgy side. Fighting and Killing are forbidden…Inside the tavern. Outside, I saw 5 people die, and a Noto PK come through killing everyting in sight. Don’t think the PK was part of the place though. There were many Role Playing Undead, Orcs, Ogres, Vampires, and other evil characters. Their language is difficult to understand, but the standard greeting is “Good Soulsssss”. The bar vendor is a Zombie, who was restocked several times by an Undead named Boz. The place is wonderfully eerie, the Orc Ale I was told is some of the best to be found (miss my Milk though). This would be a fantasy playground for any serious RPer.